this is going down a very long hall way along the other water edge 68. its perfect for out needs. The fact that the canvas is wrapped around the edges gives it a dimension and continuation look. we have them set in place but not up on the wall yet so sorry no pic. 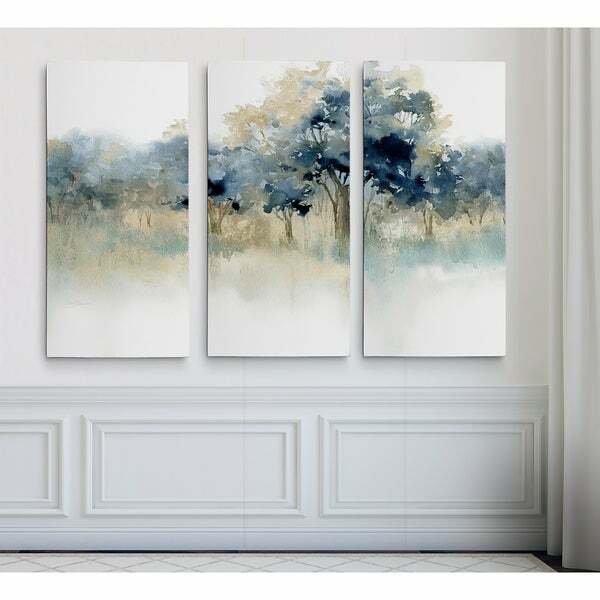 Waters Edge II -Gallery Wrapped Multi Piece Canvas A premium hand wrapped Giclee canvas. 100-percent Created to last. Individually hand wrapped to very high standards. Printed and inspected one at a time utilizing the latest archival UltraChrome Giclee inks Available in 3 sizes for you to choose from 24"X36" TOTAL SIZE - Consisting of 3 Total Panels Each measuring 12"x24" x1.5" deep 32"X48" TOTAL SIZE - Consisting of 3 Total Panels Each measuring 16"x32" x1.5" deep 40"X60" TOTAL SIZE - Consisting of 3 Total Panels Each measuring 20"x40" x1.5" deep Each piece includes hanging accessories and is ready to hang. You need only to apply an anchor to the wall of your choice. The print is beautiful, the panels were quick and easy to hang, and it compliments the blue walls in my office perfectly! So glad I purchased! This is a very nice piece. It really brings a lot of color to my room and it has a very serene feel about it. I'm happy with it. I would recommend buying it. Beautiful mixture of colors. Brightens up any room and is good to the size. I have a huge couch, and I am placing this behind it and it fits perfectly. Beautiful pictures. Just the perfect size to go over the bed in our guest bedroom. Really sets the room off nice. I absolutely love how this painting looks in my living room. Seems to be a bit expensive and a little hard to hang them all level and even but overall I am happy with the purchase. Perfect for over our iron bed in the master bedroom! Love it! Just as it was represented. Love it! Colors are beautiful. This product was smaller than I was expecting. Goes with our current color scheme. Bold enough to add to the room without being the center of attention. I ordered this for decoration.